Eske, an Alaskan native, has a strong weathered look of the wild. His eyes are a deep brown, a brown that reflects back at the viewer a sort of icy haze. His face is worn from the agony of harsh winters he spent as a child in the cold Alaskan outdoors. His build is that of the wolf in winter. He is scrawny from the cold nights and of his innermost struggle. Yet his presence and scars mark a strong will to go on. His aged appearance is that of one who lived many years in the deep artic. Despite his youthful age of twenty-six from the first glance he would appear to be in his late thirties. His hands are also worn from the hard work splitting wood as a child to keep his small cabin warm. The struggle of the cold crisp air has had its way with his exposed areas of his skin, early lessons not to remove ones mittens during the dryer days of winter. His winter worn look and his rustic appearance make him favorable to the ladies in desire of a man with the look of the wild. As an untamed fire his charismatic personality of outgoing attitude is outlined by a youthful look in his eyes of great passion and energy. His outward appearing attitude is characterized by his smile. A smile that is seemingly ever present, and growing wider with the observation of general kindness toward others. Eske is nearly always cheerful and lively. He provides that spark that ignites the candle, but like the wick and the wax he can burn out. He is a strong optimist and a team player. He always seems to try and find another inner candle to keep others going when in need, but won't hesitate to take a few moments to ascertain the situation or take time out in good health. He is outgoing and some would call him an extravert. Kindness is one of his fore most qualities, and will often try and help others by spending some of his personal time with them. Coming from the Copper River Basin of Alaska, he enjoys the very core elements of Alaskan nature and is a seasoned outdoorsman. His favorite saying is "Kindness leads to peace, which means less work for the doctor". Philosophical - He has several core philosophies that guide him at times. Sometimes these philosophies can cause him to question his orders. Helpful Assistance - He has a strong passion to help those in need. He will go out of his way and in danger himself to help others. Wilderness Caretaker - His philosophy on life is that of a caretaker for nature. He has a watchful eye on those that would harm creatures without of a necessity of survival. Collector - He also enjoys collecting random things from places he has visited. Sometimes these "nit-knacks" pile up. Respectful Angler - While fishing Eske employs the safety and code of a seasoned angler. He also tries his best to use harmless hooks and practices catch and release. Survival instinct - The struggle of life as a child living alone in Alaska has earned him a survival instinct. He can employ his creativity and inner knowledge to assist him in dangerous situations. Painful Youth - The loss of friends and family as a child has scared him emotionally. He avoids talking about his family and thoughts about his early childhood are painful. Family - Eske desperately wishes to find his family who had left suddenly one night while he was a small boy and was never seen again. Medicine - He has medical ambitions. He would like to help find a treatment and raise awareness of the illness that crippled his town elder that helped raise him since he was small. Charity - He also has a strong desire to help other abandoned children pursue their dreams. Travel - He wishes to visit some of the more defining stars of the constellations. Philosophical - He, through his own pains of living, has developed a desire to find if life can exist without struggle. Astronomy and Philosophy - The old constellations and philosophies his town elder, Kaskae, shared with him as a child is stuck in his mind. Outdoors/Wilderness - He loves camping and taking hikes to places where he can see the stars at night. Angling - Fishing is something he has done since a boy. Originally it was what he did for a meal, but now he fishes for fun with special harmless hooks and practices catch and release. Water sports - Kayaking was something he picked up later in his teenage years while living with his adopted parents. He enjoys all kinds of kayaking and has developed quite the talent. Yup'ik (general Alaskan) - Later Eske learned the more common Alaskan language taught to him by the town elder of his adoptive parents. 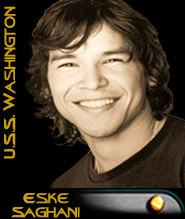 Eske Yakone (red aurora) Saghani (Raven) was born to Denigi (moose) and Sesi (snow) Saghani (raven) in 2358. His parents would read stories to him at night as a small child. His father, Denigi a doctor, would often take trips to other towns to treat others. One night his Eske was alone while his parents were away from the town a snowstorm hit and wiped out the town communication relays and generators. Eske had to fend for himself during the storm, while snowed in at his parent's cabin. After he was rescued his parents were nowhere to be found. The last communication reported from his parents, a message from their transport, requesting help. They were assumed dead and never heard from again. A day - then a week- then a month went buy, still they did not return. Thankfully the town elder, Kaskae, heard about Eske and took Eske in as his own. Eske agreed to live with Kaskae (chief), but only until his parents returned for him. To this day he still believes his parents are alive and well somewhere in the wilderness of Alaska. While living with Kaskae, Eske was taught everything he would need to know to survive in Alaska and the world outside of his home. He and Kaskae would take periodic trips around the area and, on the rare occasion, to places off world. During these trips Eske would sometimes camp outside for fun. It was in the outdoors he found a love for watch the stars. Kaskae encouraged his interest with the stars with astronomy and helped him learn the constellations. As Eske grew, he and Kaskae would take trips off world. They would either book transport on transport vessels or on the rare occasion take an old star yacht his parents had left him. It was during these trips in the old star yacht he learned about starship navigation and repair work. On one occasion the old star yacht broke down only to be rescued by a star fleet emergency response vessel. Although, he only had a short ride to the local star base he enjoyed every minute of it. Afterwards he dreamed of charting the unknown. He was confident that he and Kaskae could take trips across the galaxy if he applied himself in his studies. Then one quiet winter day, Kaskae died. It came as heartache; one week later was Kaskae's 61st birthday. Eske was only twelve years old, and the painful memory still haunts him. Soon afterwards an Alaskan family on the western coast of Alaska, whom cared for Eske until he was ready to live on his own, officially adopted Eske. Eske spent every day studying medicine, mathematics, and science with his father's old books he'd collected from his parent's old cabin. At sixteen he wanted to leave for Star Fleet Academy, but his adoptive parents didn't approve of a Star Fleet career. They wished for him to go to a private Alaskan college to study medicine. One night he left and caught a ride with a transport to San Francisco. He took the entrance examines and was later enrolled as a student. It was a drastic change for Eske, who was use to living on the frontier where he could see the stars. Eske studied at the academy for two years in science and pre-med studies before enlisting as a lab assistant. During his time at the academy he spent most of his time hanging around an old Italian restaurant with a few of his closer friends. He enjoyed the atmosphere and claimed it helped take the edge off before an exam. For the most part, his grades remained average. Although his grades seemed to show some improvement during his second years at the academy, he decided to leave the academy for a posting on a ship. Before he shipped out his adoptive parents located him and paid him a visit. They were disappointed that he hadn't finished his studies and argued with him the entire time of their visit. After confronting his adoptive parents he gave them the middle finger salute and never heard from them again. Eske Served aboard a science vessel as a lab assistant for two years, before switching to USS Armageddon as a medical assistant. During his time aboard the science vessel he worked under the prestige of Dr. Rayen. Dr. Rayen taught him the importance of organizational skills and efficiency. He was instructed with precision and learned the in outs of running a laboratory. With Dr. Rayen's influence he actually enjoyed working hard. Science was fascinating to him, but Eske still wanted to try out a medical career. He requested transfer to the Armageddon, and soon afterwards the science vessel was mysteriously lost with all hands. His time aboard the Armageddon was brief. Shortly after his assignment the Ambassador class ship was decommissioned. However, he enjoyed his time as a medical assistant that he decided to go back to the academy to finish his medical studies. It took him three additional years, but he was glad to finally be ready to move on. He decided to take his last year abroad on an aboard a training vessel as temporary nurse while completing the rest of his officer training. During that year he learned the ups and down of the medical facilities. The ships doctor, Kirana, took him under her wing and showed him the ropes to effectively treating a ship with limited resources. He learned how to improvise and think on his feet. Something he hadn't been too skilled at. He worked hard, and after a year he was given the rank of ensign and continued on a the ships medical assistant for another year learning all that he could. After the year was up Dr. Kirana left the Scotty for another assignment, and Eske soon too decided to move on. He requested transfer to something more challenging. After a few months of waiting for reassignment he learned about the USS Caesar being refitted and took the job of a Medical officer.